FZ Clients Conclient Win Soup! Josh Playle, of Formation Zone clients Conclient Ltd, is the latest winner of GAIN Soup. Conclient beat competition from other new or growing digital businesses pitching at Soup. Josh Playle, of Formation Zone clients Conclient Ltd, is the latest winner of GAIN Soup. The audience, in Plymouth University’s Graduation Marquee on the Hoe, heard four pitches from digital entrepreneurs over their breakfast and it was the first pitcher of the day, Josh, they chose to invest in. Conclient offers a website which is designed to bring together engineering consultants and their clients and 22-year-old Josh aims to develop the site further before moving on to develop an accompanying app. Conclient beat competition from other new or growing digital businesses pitching at Soup, which included Krowdthink, Care Control Systems and E3 Enterprises. After being voted the favourite by those attending, Josh won a grant of £750 which included funds generated from the event ticket sales, as well as a package of business support from GAIN, Devon Chamber of Commerce, City College Plymouth, and the Formation Zone and Futures Entrepreneurship Centre at Plymouth University. 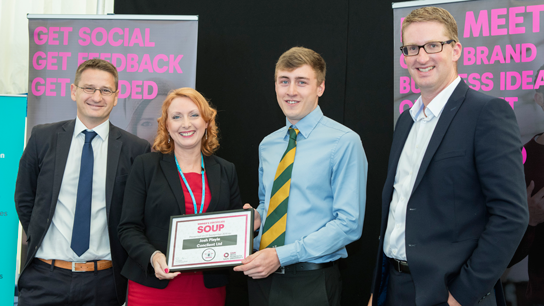 Find out more about future Soup events in Plymouth by visiting the University website here.